This is a machine I only bought because I'm a sucker for creative solutions, and it was very neatly done. It comes from British Columbia in Canada. 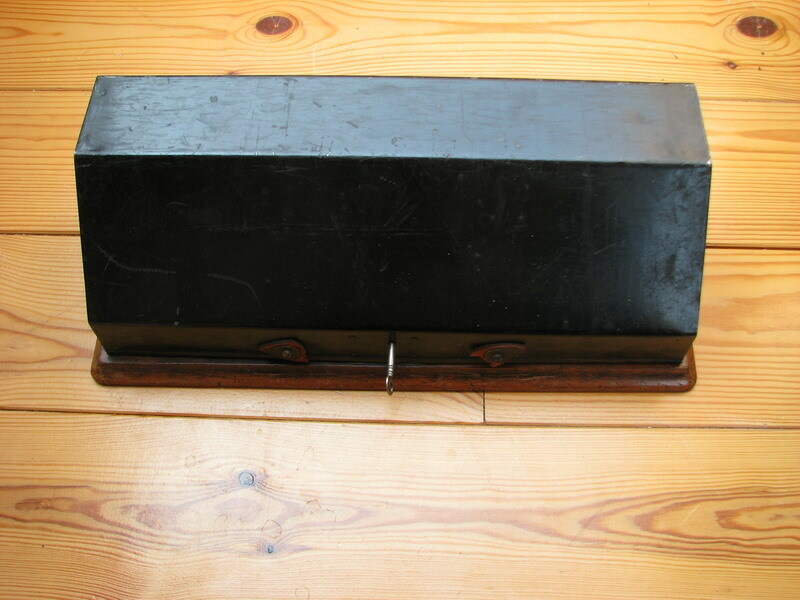 The first picture is very promising, as this is a very early case, and a long one at that, meaning it is a Brunsviga A. It is complete with the original key. 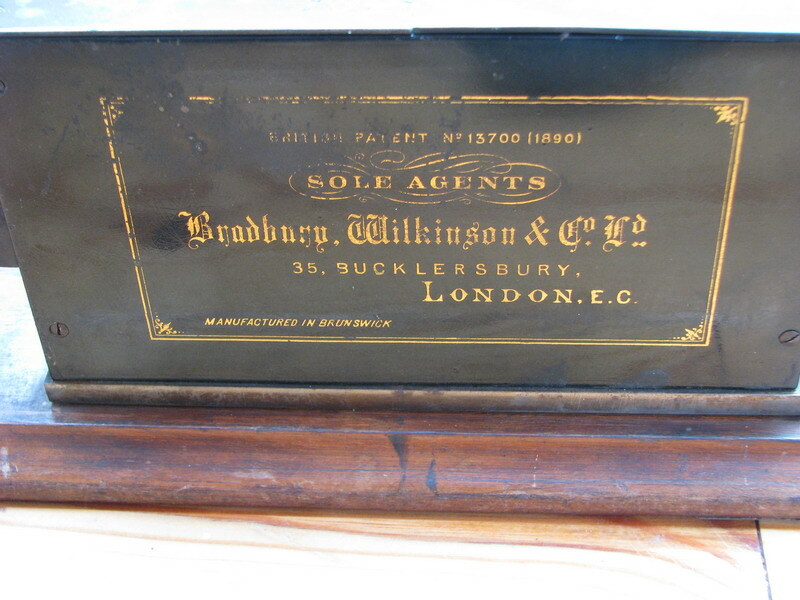 ...as well as the distributor's marking on the back, showing it was sold in London, apparently after Bradbury moved from High Holborn to Bucklersbury. Unfortunately neither of the buildings at those addresses today date from before the 1890s ... 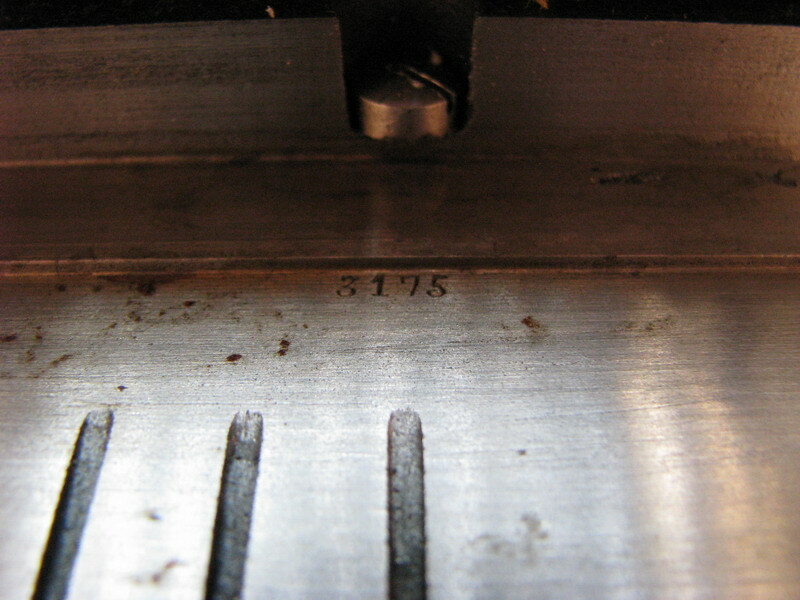 The serial number of the machine, stamped into the baseplate, is 3175, which suits the general shape and markings on the machine. However, after the machine had already lead a productive life, someone got a little creative. 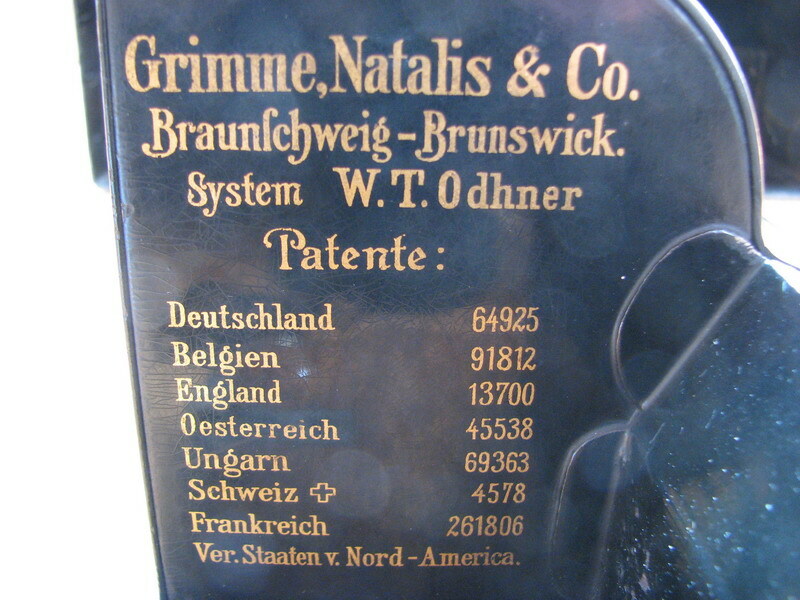 The fact that parts of the carriage (namely 6 tens carry levers) have been replaced with parts from a later donor machine which did not have the numbers for these tens carry levers stamped into them leads me to believe that the machine had been used for a while, and perhaps put aside after some of these parts started breaking. 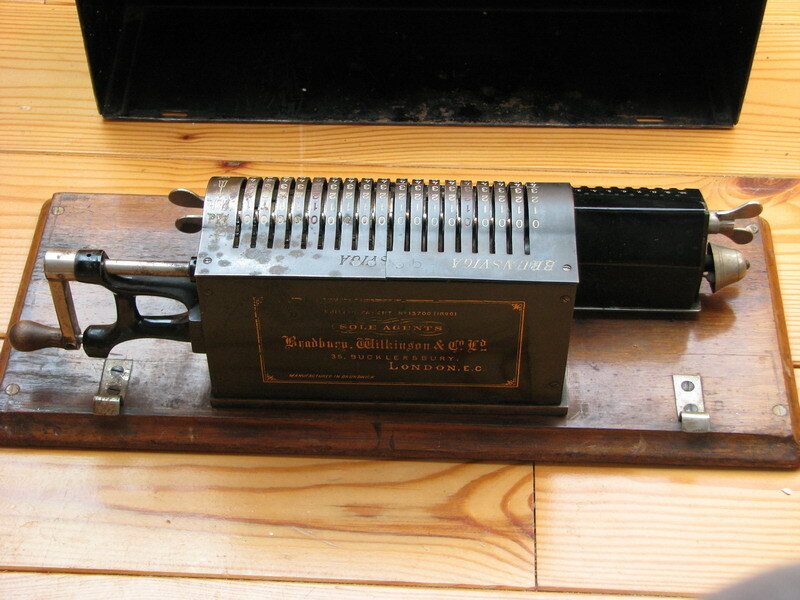 Possibly when the Brunsviga Triplex came out in 1911, someone must have thought this to be an excellent idea, and they cobbled the old Brunsviga A together with a later Brunsviga B donor machine, not only to repair any damaged tens carry levers, but also to extend the size of the pinwheel cylinder from 9 to 17. This involved a few adaptations obviously. 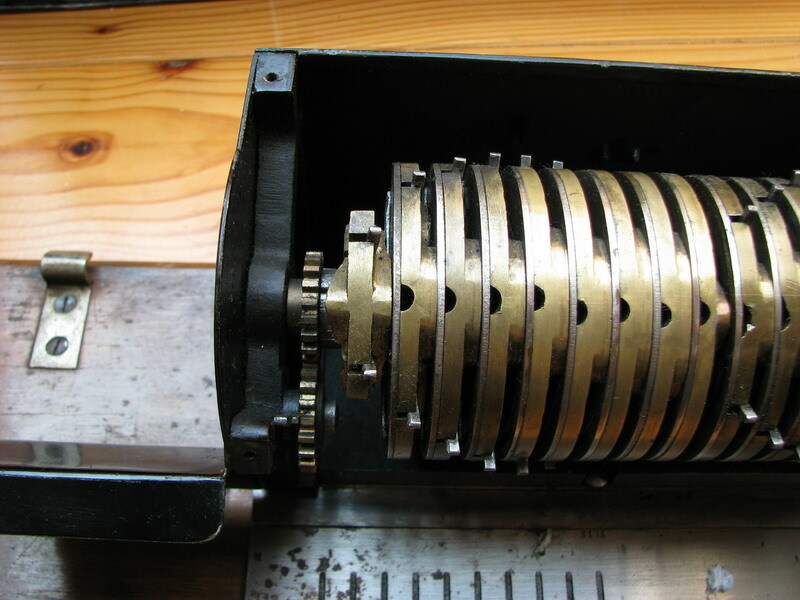 Since the complete pinwheel cylinder will not fit next to the existing one in the frame of a Brunsviga A, the leftmost pinwheel was left off. ... but required a bit of grinding. 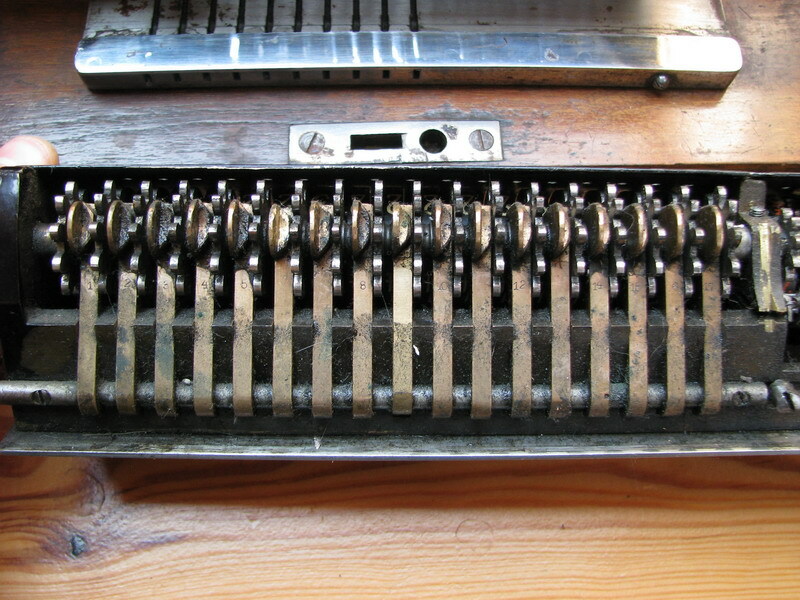 Putting two existing pinwheel cylinders next to each other messes up the tens' transfer, as the sprung pins in the pinwheel cylinder will suddenly shift on going from one pinwheel cylinder to the next, and the tens' carry will not work. Brunsviga themselves had to go to the largest pinwheel cylinder they ever constructed in the Brunsviga D in order to be able to solve this problem with the timing of the continuous tens' carry in both directions of rotation. The owner/mechanic could have left out the first pinwheel, nr. 1, instead of nr. 9. 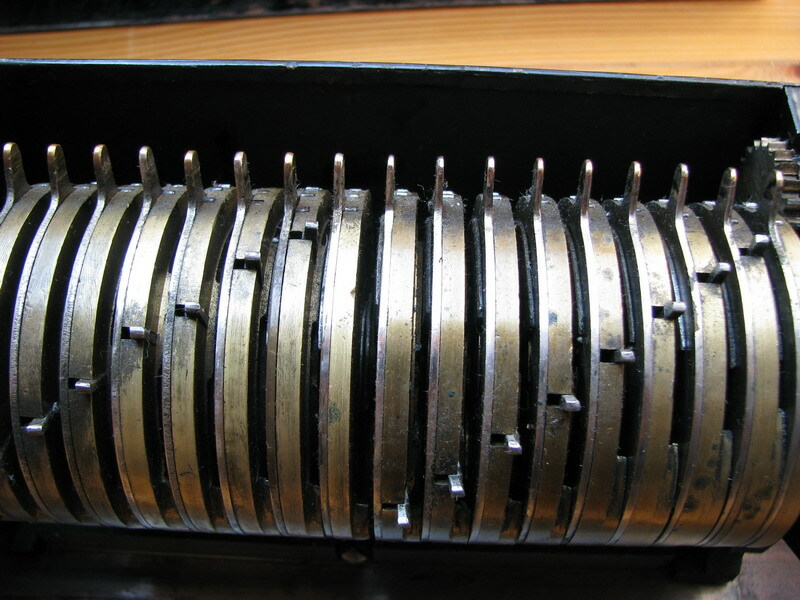 As it is now, the machine requires a spacer between the first pinwheel of the second machine and the last pinwheel of the Brunsviga A, as the first pinwheel is a different, more narrow casting. 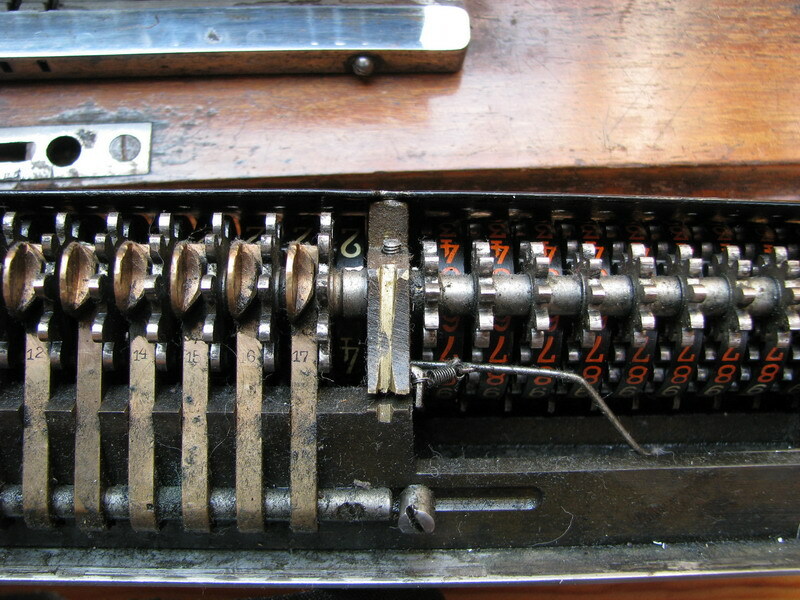 In addition, a copper piece had to be soldered on in order to push the ten's carry nose back into its zero position in order to avoid a spurious tens' carry after shifting the carriage. This was probably only discovered after the machine was put together, as that problem too would have been easily solved by using pinwheels 2-9 instead of 1-8 of the second machine. 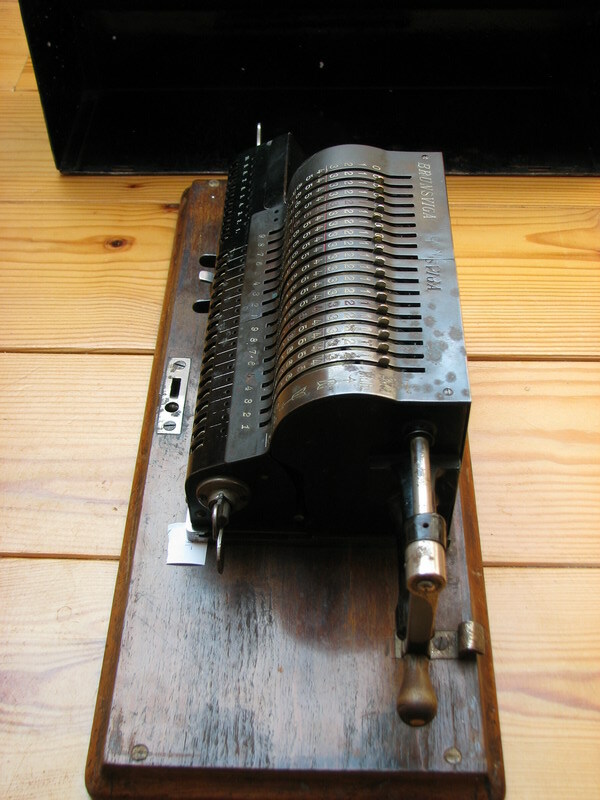 The effect is that of an early double machine - two separate pinwheel calculators, each counting in their own part of the carriage having a 9 digit capacity. 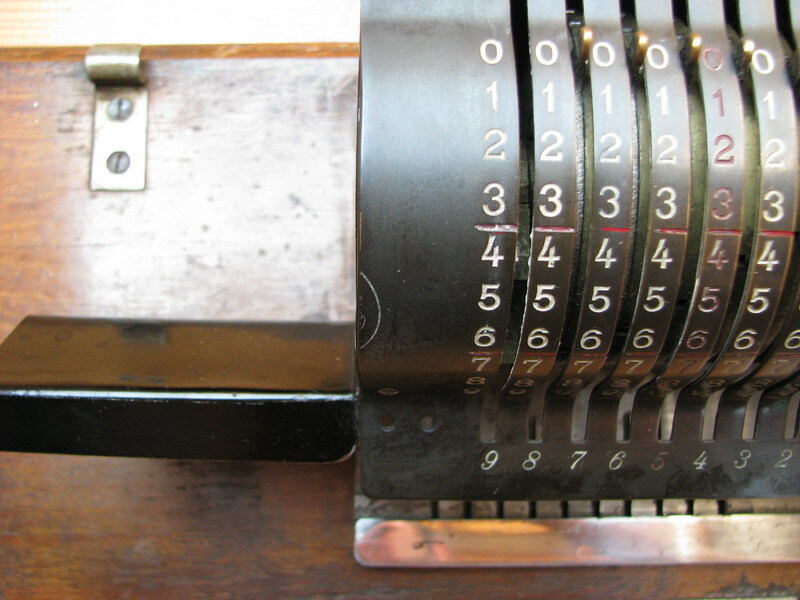 The machine operates correctly in this way as long as the carriage is left in the two rightmost positions, as soon as it moves beyond that, the leftmost digits in the lefthand machine progressively stop engaging with the result register. 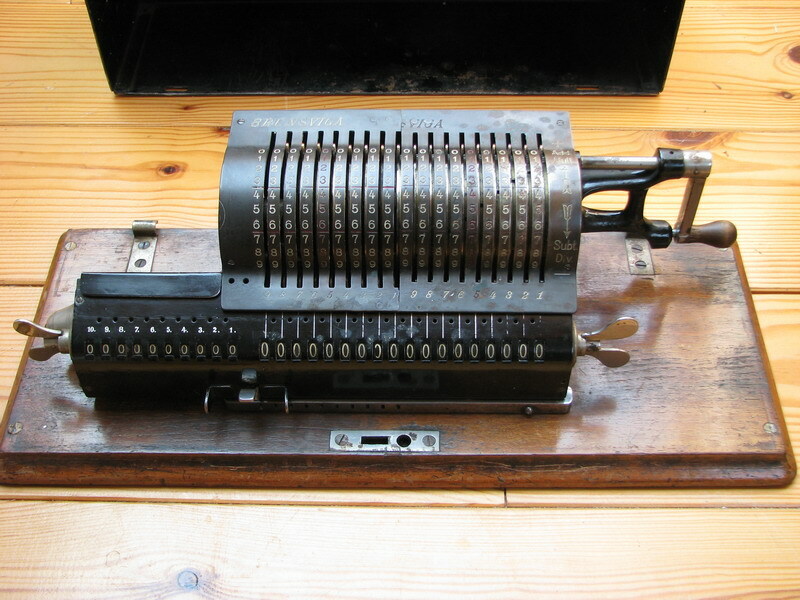 In order for this to be able to work, also a bit of grinding to the carriage was necessary, for the non-working pinwheels and tens carry pins to be able to pass the brass post between the two registers. 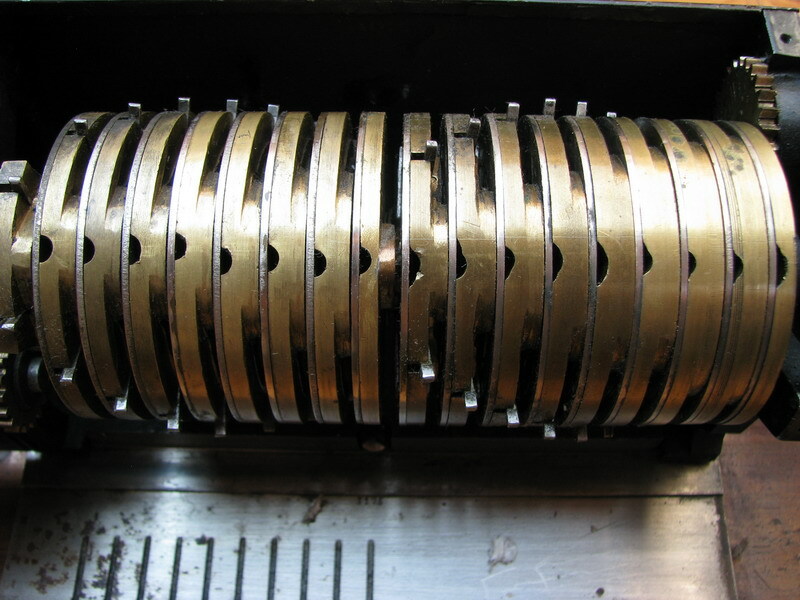 Once the machine worked mechanically, the top plates from both machines were cut and riveted together. 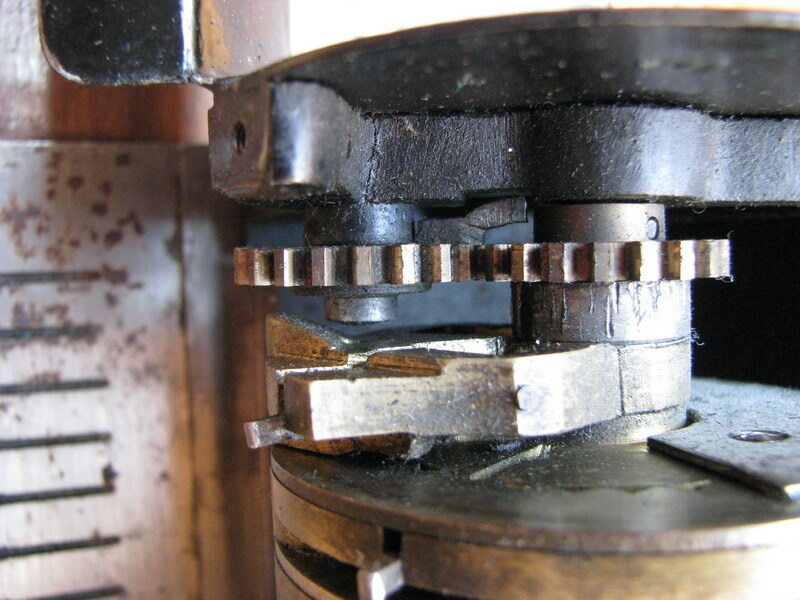 The one on the right is the original top plate of the machine, the one on the left is from a later Brunsviga B. 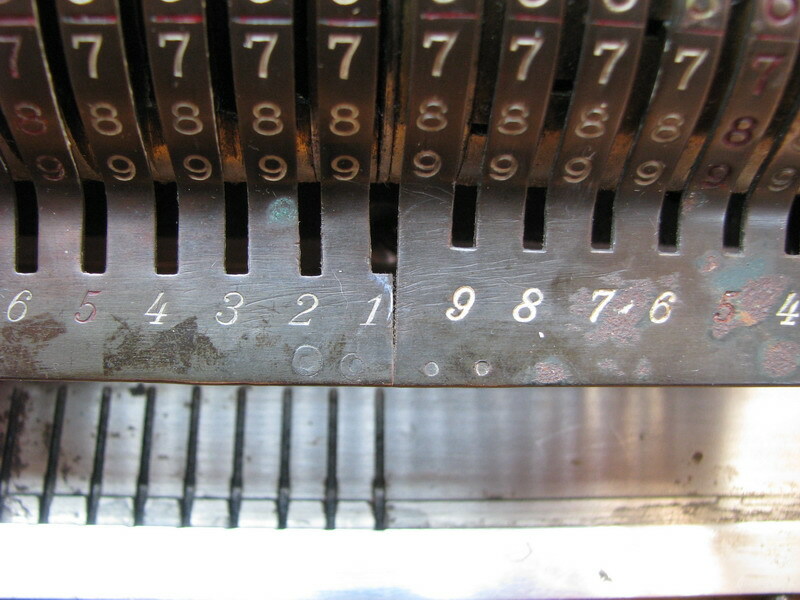 Notice the longer slits, the position of the Brunsviga lettering with respect to the input pins (the "A" is over the 5th pin for the lefthand machine, and between the 7th and 8th pin for the righthand machine), and the cut through the Brunsviga logo right at the edge. 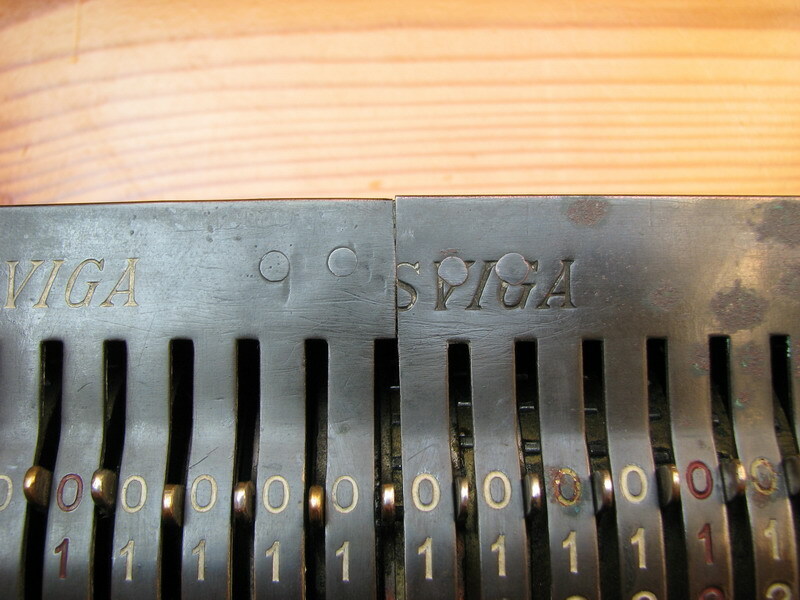 Cutting the left part of the top plate in a different position would have messed up the numbering of the input pins at the bottom of the slits, and still not have completely retained the Brunsviga logo. 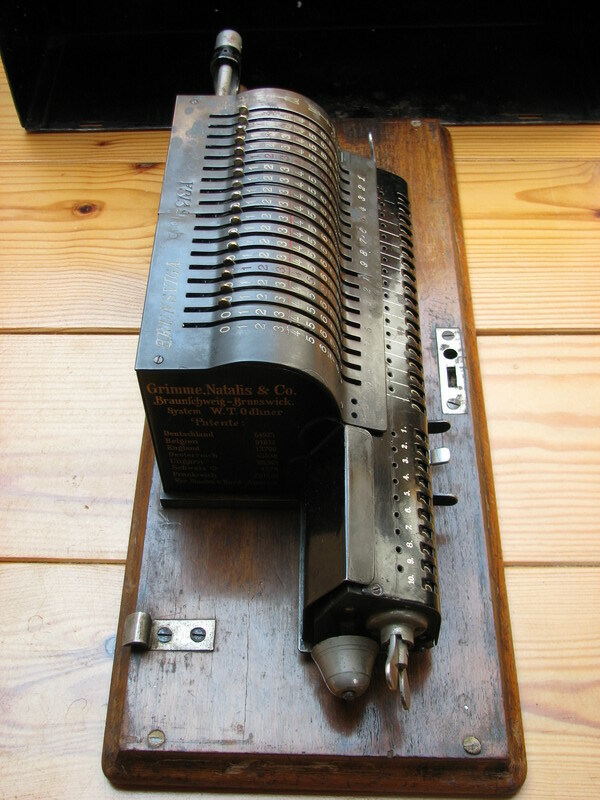 It would however have had for effect that the empty 18th slot on the top plate would have been eliminated.